Upstairs in my bonus room I have a small tree that requires the attention of a newborn. Unfortunately, it has the production value of a constipated hen. It was expensive, as two-foot tall trees go. Special soil and a certain pot were necessities. While it soaked up the Summer sun, fantastically fragrant blossoms grew, then fell off. Cold temperatures came, so it had to come inside. More blossoms, more skydiving without a parachute. Now, I’m left with something even Charlie Brown would be embarrassed to call his own, and yet, I won’t get rid of it. 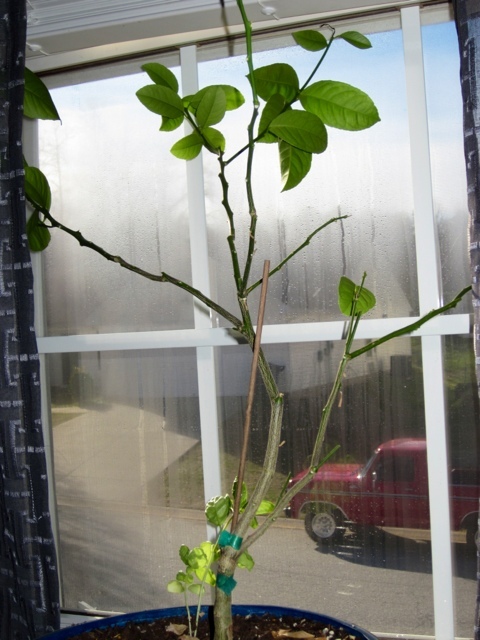 My hope is that it’ll eventually give me at least one Meyer lemon. THAT’S how much I’ve grown to love this little guy. The peel is somewhat soft. It’s not a vivid yellow like its sour soul sister. Instead, it’s a deeper yellow with an orange tint. Smell it and you’ll know you’re not in Puckerville anymore, Dot. Its scent is sweet, and floral. 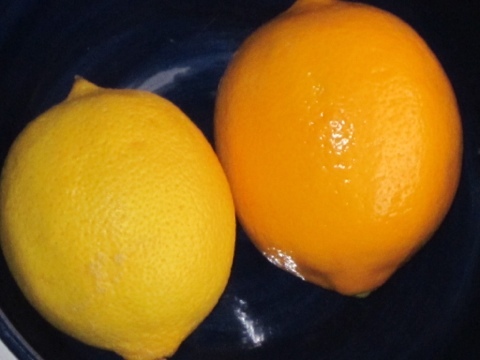 The Meyer lemon is said to be a cross between a lemon and a mandarin orange or a regular orange. It came from China, but made its way over here when an explorer who worked for the USDA brought back a clipping. If I could give him a high five, I would. 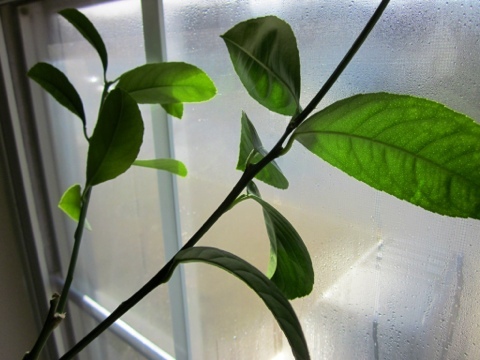 At Lowe’s, I found dwarf Meyer lemon trees. Despite not being a cold weather tree and it’s price, I bought one and babied it. That got me nowhere, as described in detail above. 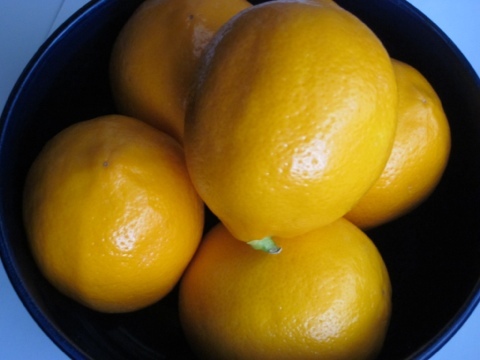 This year, my Meyer lemon love came back with a vengeance. 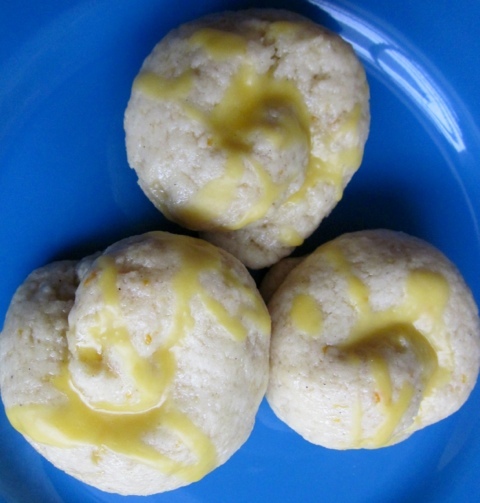 After one trip back to The Fresh Market I had enough stock to make cardamom-scented Meyer lemon cookies. I used my mom’s anisette cookie recipe, nixed the anis and added ground cardamom, zest and juice. I made a glaze, dipped them in that and topped with an icing. I liked the delicate flavor. I loved seeing bits of zest throughout the cookie. With the few Meyers I had left, I made amaretto sours. Add ingredients to a cup with crushed ice. Stir. Garnish with a maraschino cherry and a small slice of an orange. This drink was beverage bliss. 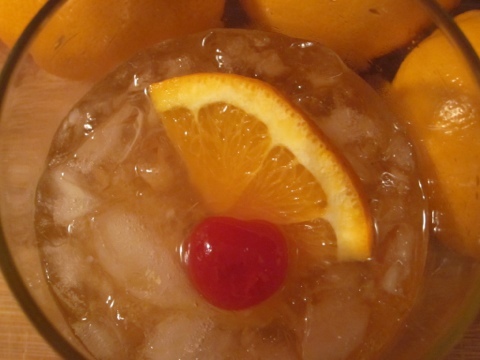 I’m an amaretto sour fan from way back, but this version was my favorite. No sugar-loaded sour mix. Doing it this way gets you a pure flavor and an added sweetness from the Meyer. The flavor was deeper, I swear. Trip two to the Fresh Market led to another bag of Meyers. A late night trip to Ingles (for something else!) led to an inner celebration when I found a bag of Meyers in the produce department. These were packed by Sunkist. They’re smaller, but the price was lower. Overall, they’re not a beautiful as those from the Fresh Market, but I was happy to have them. In that round, I made Meyer lemon chicken piccata and Meyer lemon risotto with shrimp. 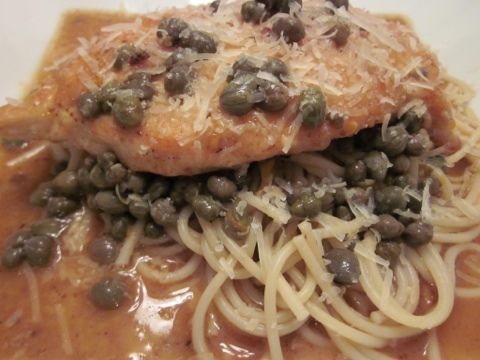 The piccata was bring-a-tear-to-your-eye good. I mean, really. The zing didn’t punch you in the face, but boy was it there. 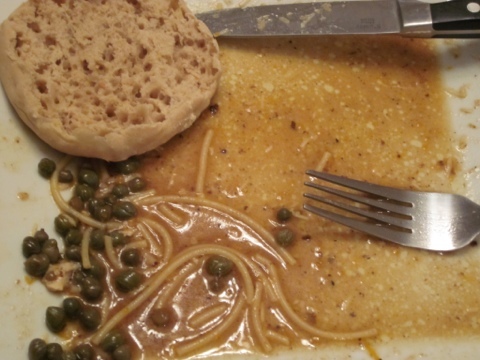 The briney bite from the capers counterbalanced the sweetness of the Meyer perfectly. I had to whip out an English Muffin to soak up what was left of the sauce. 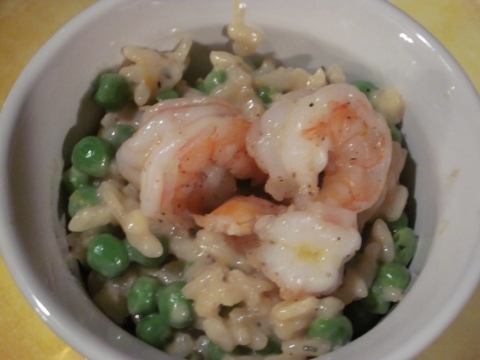 The risotto was creamy and had a real punch of Meyer flavor. Shrimp and lemon are good friends, so that was a good match. If you haven’t made risotto before, be warned. It is a time-consuming process. 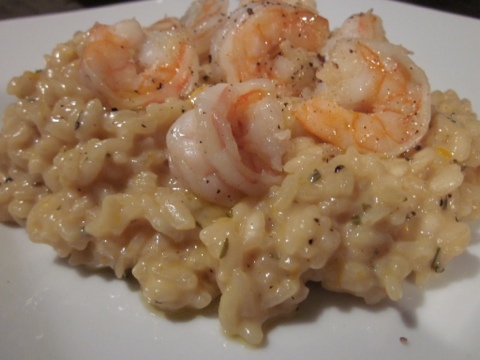 Risotto gets its creaminess from its high starch content, which is activated by the constant additions of hot broth and heaping helpings of non-stop elbow grease. plated it. I did add the peas to what was left in the pan. The sweetness of the peas and the literal pop of texture made a big difference. That version was a hit as a leftover lunch. The good news: I still have several Meyers left. The bad news: the crop is the biggest in the Winter… So our time together is dwindling. If you haven’t tried one, do it. Hopefully you’ll love them as much as I do. Or, you may think I’m a citrus psycho with nothing better to do. Either way, you will have met the Meyer, and that is good enough for me. Meyer running out of time. Meyer going to be sad if you miss out… Meyer probably tired of reading the word Meyer. 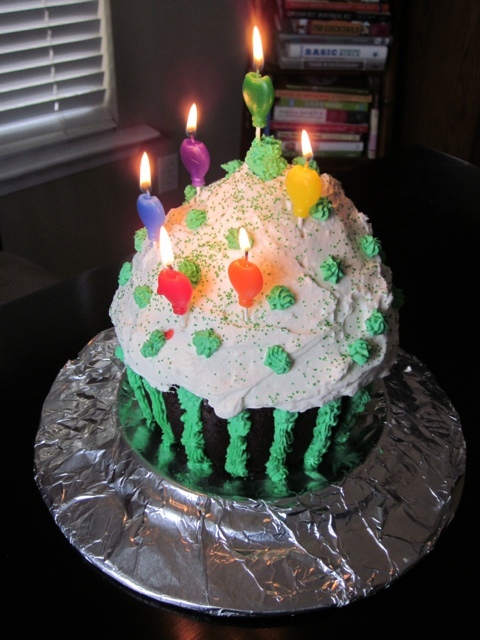 Tip: Don’t be a slave to the birthday bakery. Make the cake yourself. It’s cheaper and it’ll mean more to the aging recipient. I recently made a giant cupcake with one of those special pans (if you do it, fill the bottom first and bake for about 20-25 minutes, then fill the top and continue baking -otherwise the top will burn) and topped it with a cream cheese whipped cream icing. It got rave reviews. You can do it. You don’t need a pastry bag to be a hero, you just need the will. That’ll be the best present you can give. That is one tasty looking giant cupcake! It could almost make you look forward to getting older.